How is the Green Book used? 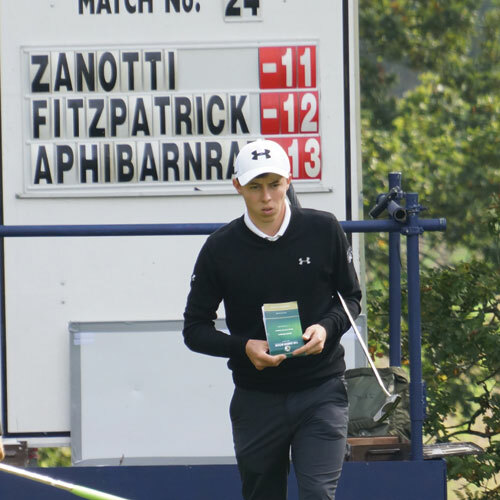 Using the Green Book requires knowing the positions of the hole and your ball. The holes are currently usually plotted in position using the pin positions provided by the Tour and checked the day in advance using the sprayed dots. 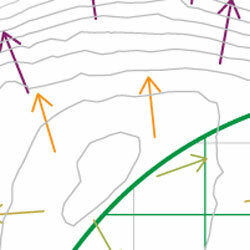 Ball position can be calculated by referencing points like sprinklers, sprayed marks (Front and back of green) bunkers and larger mounds and hollows. Which way is the ball breaking? Detailed knowledge of the slopes will make for better judgement of the correct line to the hole. Is the putt uphill or downhill? Accurate measurements of surface rises and falls will help judgement of pace. How much is the ball breaking? How do I know what line I have to the hole? Knowing the slopes around the green in detail will enable accurate planning of approach shots. How much will the shot release after 'pitching'? Using slope information in the landing zone. Which side of the pin is best to putt from? Where is the best miss? Using slope information on the whole green and surrounding area to plan worst case scenarios. What is the line to the pin from various landing areas? Reading the line of short approach shots is just as important as when putting - but especially with pitch shots where often you can't easily get onto the green to study the lines before making your shot. The arrows indicate the direction of fall directly downhill known as the 'break line'. So a putt directly up or down the direction of an arrow should not break to either side (unless affected by wind, grain etc.) So a putt at 90 degrees will be affected by the break more than a putt at 45 degrees to the break line. The contours connect a series of points of the same height. Each contour is separated by 24mm of fall. So if the contours are closer the fall is steeper. Direction of fall arrows run at approximately 90 degrees to the contour lines. The numbers we display are known as percentage fall. For example a 10mm fall over 1 meter is a 1.0% and a 25mm fall over 1 meter is a 2.5% fall. As a rule of thumb on the European Tour pin positions aren't usually in areas steeper than 2.5% fall on 11 stimp greens. Currently we show a grid in yards starting from the Front of Green set out for the tournament and sprayed onto the ground - which is also used for pin placement information.